I’m as big a fan as anyone of the vague, often times, dark ending to a good novel, but being the old-fashioned girl that I am, who still believes in fairy tale endings, I was so relieved to reach the end of The Precious One and find that it had a neatly wrapped-up, sunny ending. I am just feminist enough to appreciate the fact that it’s popular for heroines in modern women’s fiction stories to save themselves from their own conflicts, and the beautiful characters in this novel do, but with the help of some pretty shiny knights standing beside them. So refreshing. I had planned to make my own version of the ubiquitous curried chicken salad that De los Santos included in the book, to go along with it, because it made me laugh that everyone in the neighborhood seemed to shop at the same corner specialty food store, and some tried to pass the dishes off as their own, not realizing that the people they served them to would know they hadn’t because they were commonly served on their own dining room tables. I loved that. I just really did. 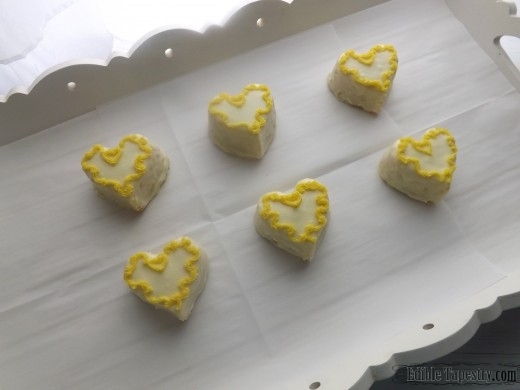 But then lemon ricotta cookies were mentioned at a key point in Taisy and Willow’s story and I decided I just had to have them…in my post and in my belly. When I reached the end, I was so glad that I did because I found it more poignant to turn those cookies into cakes, sweetly shaped and decorated, perfect for a bridal shower. 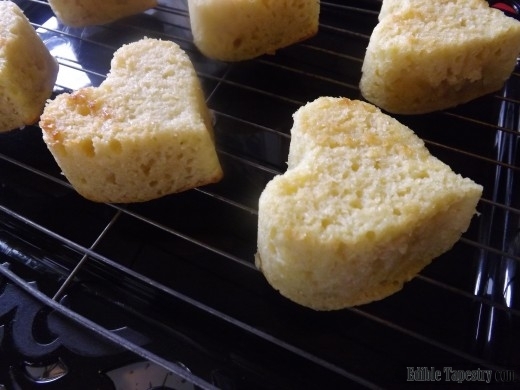 I used a heart-shaped silicone muffin pan to make my cakes, but a regular cupcake pan or mini bundt pan would also work well. Layered into little petit-four cakes with buttercream in between the stacked cakes would make ideal “eat me” cakes for a tea party. The buttercream decorations just gave them a little more color and interest. 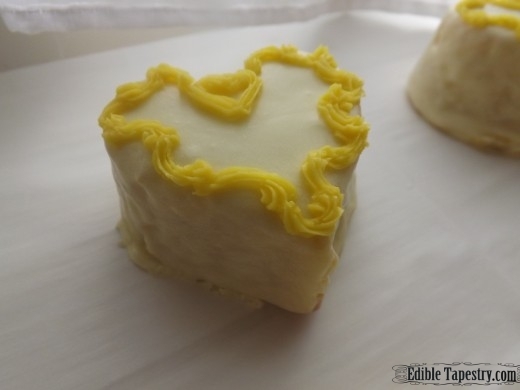 Pre-made royal icing flowers that are sold with cake decorating supplies would be a simple, fun substitute to piped accents. 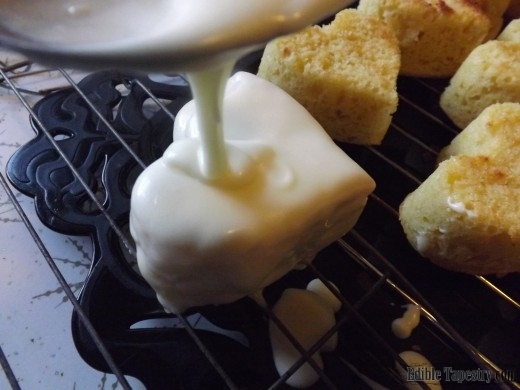 It should be noted that the poured fondant takes several hours to harden over the moist cakes, so they should be made a day or two in advance. 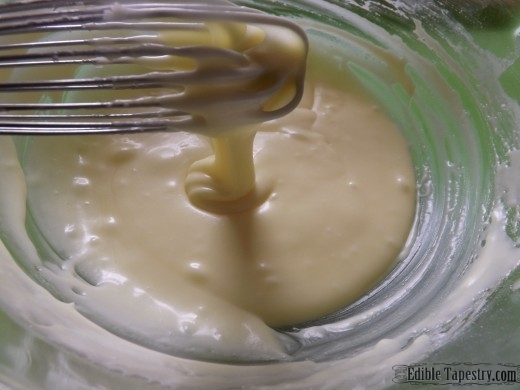 Make the cakes by first creaming the butter with a mixer. Add the sugar and cream together. 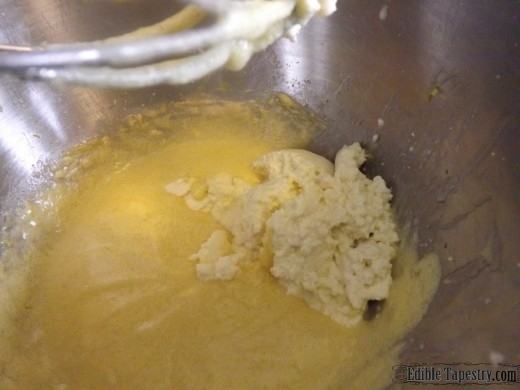 Beat in the eggs, one at a time, the vanilla, lemon zest and juice. Whip in the ricotta. Sift together the dry ingredients. 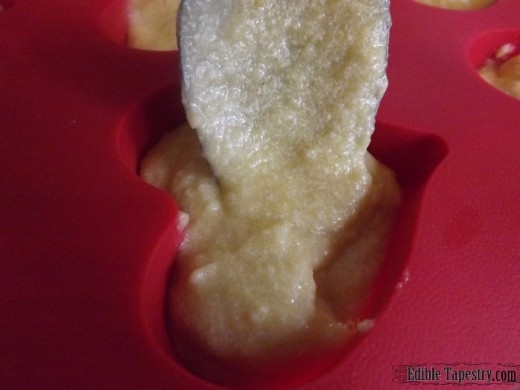 Fold into the wet ingredients until just moistened.